Wouldn’t it be magical if you could find a photographer who makes you and your groom feel as though you have a dear old friend capturing the most wonderful memories of your special day? That is exactly what we offer, with the added bonuses of our expertise, patience, and exceptional creative talent. We will make you feel completely at ease. You made the right decision when you chose The Royalton for your special event. The venue has a history that dates back to 1918 when the estate house was commissioned by industrialist Edward Moore. Completed in 1922, it remained the Moore’s home for twenty years. 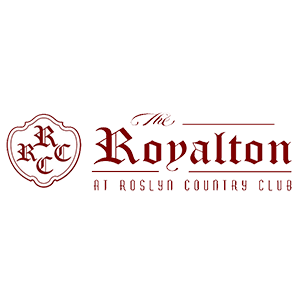 During the 1950s it became the Roslyn Country Club neighborhood. It was transformed into the venue it is today by Michael Einhorn, of Jem Caterers. The Royalton encapsulates timeless tradition and old-world elegance. From the moment you take your wedding vows, you are embarking on a new life with your soulmate, so it’s imperative that you make this day as magical and memorable as possible. Because the Royalton staff are specialists, they can help you create the wedding you deserve, with no details spared. One of the most appealing aspects of the Royalton is the impeccable landscaping. You will find a combination of fountains, exotic plants and flowers all surrounding the delightful Ivy Court. Every inch of the Royalton provides a stunning backdrop for those memorable wedding photographs. The Royalton Mansion offers several different rooms for your wedding ceremony, each with its own unique grace and style. The Grand Ballroom: Elegantly decorates with sconces, white marble fireplaces, and glittering crystal chandeliers, the ballroom also features new draperies and window treatments as well as Brazilian hardwood floors. The Library and Conservatory: The library is renowned for its signature mahogany paneled walls. The rich wood reaches up from floor to ceiling giving the room an air of luxury and sophistication. The plush sofas, wooden moldings, and mahogany barrister bookshelves further add to the room’s appeal. This is the ideal setting for a relaxed cocktail reception. The Foyer and Grand Stairway: Make a grand entrance to greet your guests and give up a fantastic opportunity to grab some great shots as you descend the grand stairway. Your wedding gown will be highlighted by the charcoal grey and white checkered marble floors and the large mahogany doors. You will take your groom’s breath away as you pass under the antique brass chandelier to reach his side. Your wedding menu will be created by classically trained Executive Chef Michael Rutigliano. With his cutting-edge culinary techniques, he has the flair and expertise to create custom menus for your Royalton event. Just imagine, your own mansion with your personal chef! Because we want to get to know you better, we’d like you to call us and make a date to meet. We can discuss your wedding plans and the style of photographs you’re aiming for. We will also let your peruse our wedding portfolio so you can get an idea of the type of pictures we’ve taken before. We look forward to sharing your happy day.